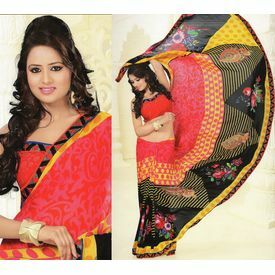 Exclusive Printed all over Patli Pattern sarees Color: Red Black Material: Weightless Occasion: Festival and Daily use Style: Flower Pattern Saree Work: Printed less border Size- Saree: 6.30 mtr (Standard) Blouse: Matching 85 cm included in saree It is perfect choice for any day function/party and daily use. Check out this lovely, varicolored saree that provides a refreshing amendment from the traditional ones! Featuring a stripe pattern, this saree can build an excellent alternative. One of the foremost fascinating apparel has hit the market that has most appealing fabric material with an embossing color. The quality of saree causes you to a head turner in an exceedingly large crowd. Its involved description work makes it far more difficult to form a final hit. There could also be color variation because of resolution of actual image.